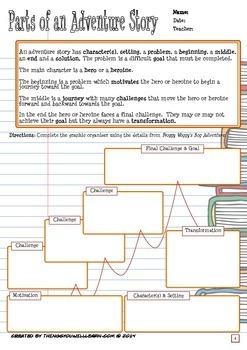 A step by step, scaffolded approach to teaching your students how to write an adventure story with the elements; motivation, a journey with three challenges, a final challenge and the hero's or heroine's transformation. 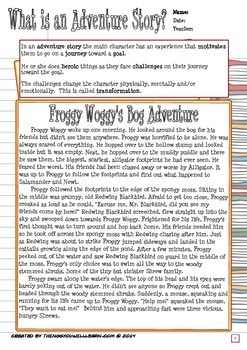 A lesson guide is included to suggest a method for leading students through a process of deconstructing and understanding a model story as part of creating their own adventure story. By using the workbook, special attention is drawn to a six-step writing process; brainstorm, draft, share, edit, revise and publish. 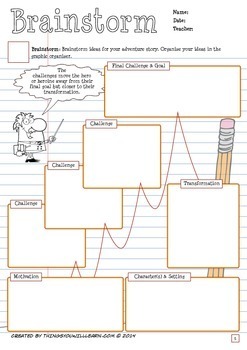 There is a checklist to aid students in monitoring their progress through a writing process. The preview gives a good overview of the content of the writing workbook. The workbook is printed on a loose leaf notebook style background. This is useful if you live overseas and have trouble finding the traditional loose leaf paper sold in North America. The final nine pages of the workbook are a larger size version of the model story found at the beginning of the workbook. These give students a good model to follow for proper paragraphing and use of dialogue. Revised and Updated on December 2014. 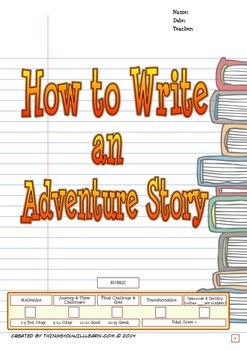 How to Write and Adventure Story by Michael Allen Kelly is licensed under a Creative Commons Attribution-NonCommercial-NoDerivatives 4.0 International License.